Resin and metal items from England. 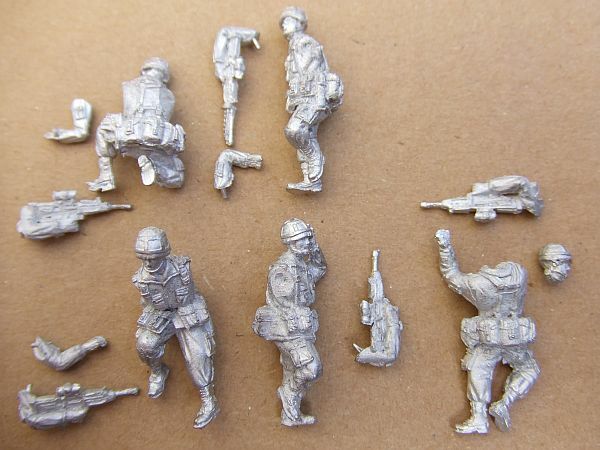 They had an extensive line of 1/76th accessories as well as some conversion sets for 1/72nd kits. They also had a line of figures. Currently out of business. Wee Friends (Friendship Models) and Kingfisher have taken over part of the range. A 33 Garage/Workshop set, Gas Welding Bottles & Trolley, Air Compressor & Trolley, Anvil, 2x Vehicle Jacks, Bench vice, etc. CO 04 Warrior Command Vehicle Upgrade set for Revell kit. CO 05 Warrior Artillery Observation Vehicle Upgrade set for Revell kit. CO 07 Fuchs NBC Upgrade set for Revell kit. CO 09 Warrior Uparmor Set Includes side and front armour, turret stowage boxes smoke dischargers etc. CO 11 Challenger KFOR Upgrade For Revell Challenger KFOR kit No. 03120; includes side armour & sand skirt, exhaust muffler, new toolboxes, back mud flaps, canvas and friendly fire panels. CO 12 Challenger II Upgrade Revell Challenger II KFOR kit to convert as seen in the Gulf, complete kit includes CO-01, CO-02, CO-10 &CO-11. A 03 Crew Set. Commander, Driver & Gunner, USMC metal. AM 1 RPG prone firing, Lee Enfield kneeling firing, AK 74 standing firing, 2 AK 74 advancing, standing with AK 74 Closer to 1/87 than to 1/72. AM 2 Leader kneeling with binoculars & AK 74, 1 with Lee Enfield advancing & LAW carried, AK 74 plus Grenade launcher, prone with AK 74, prone firing RPD (LMG), Stinger firing Closer to 1/87 than to 1/72. AME 1 Captured 81 mm Mortar and crew Closer to 1/87 than to 1/72. AME 2 Captured BM 14 Rocket Launcher & crew Closer to 1/87 than to 1/72. AMS Afghans with pack mules (2x Mules, 2x Guides) Closer to 1/87 than to 1/72. CF 1 BMP Commander (dismounted), Officer, RTO (Radio) SAM 7, Sniper, Trooper with Grenade Launcher Closer to 1/87 than to 1/72. 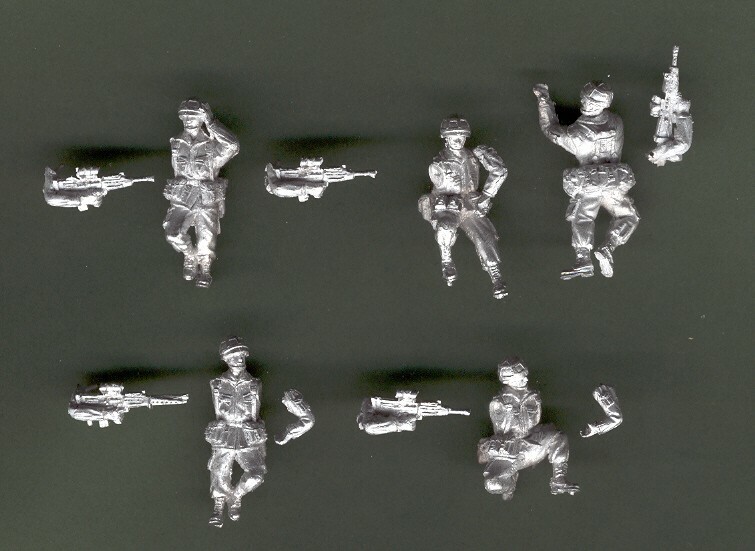 CF 2 Trooper firing, standing, advancing, RPG, prone, RPK LMG Closer to 1/87 than to 1/72. CF 3 Trooper with RPO, RPG 18, prone AK 74, 3 Troopers advancing AK 47 Closer to 1/87 than to 1/72. CF 4 Para with sniper rifle, kneeling, standing firing, prone firing, 2 advancing Closer to 1/87 than to 1/72. CF 5 Officer with AKR (SMG), RTO, RPG 7, kneeling with AK 74, prone with AK 7 RPK 74 Closer to 1/87 than to 1/72. CFE 1 AT 3 MALYUTKA (Sagger Missile) & 3 Crew Closer to 1/87 than to 1/72. CFE 2 AGS 17 Grenade Launcher & 3 Crew Closer to 1/87 than to 1/72. CFE 4 81 mm Mortar and crew Closer to 1/87 than to 1/72. 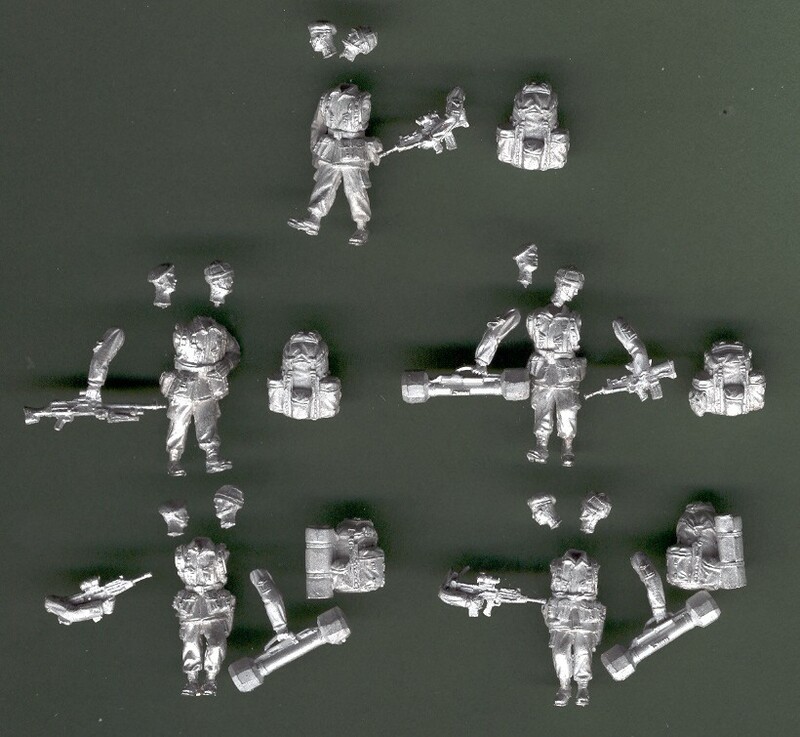 CFE 5 BM 14 Rocket Launcher & crew Closer to 1/87 than to 1/72. CFES 1 120 mm Mortar 4 Crew & Ammo Boxes Closer to 1/87 than to 1/72. CFES 2 AT 4 SPIGOT (Missile) & 3 Crew Closer to 1/87 than to 1/72. CFES 3 PKM MG on Tripod & 3 Crew Closer to 1/87 than to 1/72. CFVC Tank Commanders 6 full length figures. Closer to 1/87 than to 1/72. DF 09 1942 Africa set Casual poses. 5 figures. DF 11 Russian AFV crew One full figure sitting, 4 figures. US 1 Infantry (Kevlar Helmets) Platoon Leader, RTO, M249 (LMG) advancing, M16/203 (Grenade Launcher) advancing, 2 M16 Riflemen advancing Closer to 1/87 than to 1/72. US 2 Infantry (Kevlar Helmets) M246 Gunner prone firing, M16 standing firing, M16 kneeling firing, M16 prone firing, M16/203 standing firing Grenade, kneeling firing LAW (Anti-Tank Launcher) Closer to 1/87 than to 1/72. US 3 M60 (MG) Gunner prone firing, M60 No 2 prone, Sniper kneeling firing, M16/203 kneeling covering, Stinger firing, Dragon (Medium Anti-Tank Weapon) firing Closer to 1/87 than to 1/72. US/GC Artillery Crew, Ammo Bt Closer to 1/87 than to 1/72. US/S1 Section Leader with M16, RTO kneeling, prone firing LMG (M249), kneeling, firing M16, prone M16, standing fring M16/203 (Grenade Launcher) Closer to 1/87 than to 1/72. US/S2 Advancing with M21 (Sniper rifle), advancing with Dragon (ATGW), standing M16, advancing M16, advancing M16/203, kneeling with M249 (LMG) Closer to 1/87 than to 1/72. USE 1 82 mm Mortar & crew (Kevlar Helmets) Closer to 1/87 than to 1/72. USE 2 TOW Missile and crew Closer to 1/87 than to 1/72. USE 3 M60 MG on Tripod and crew Closer to 1/87 than to 1/72. 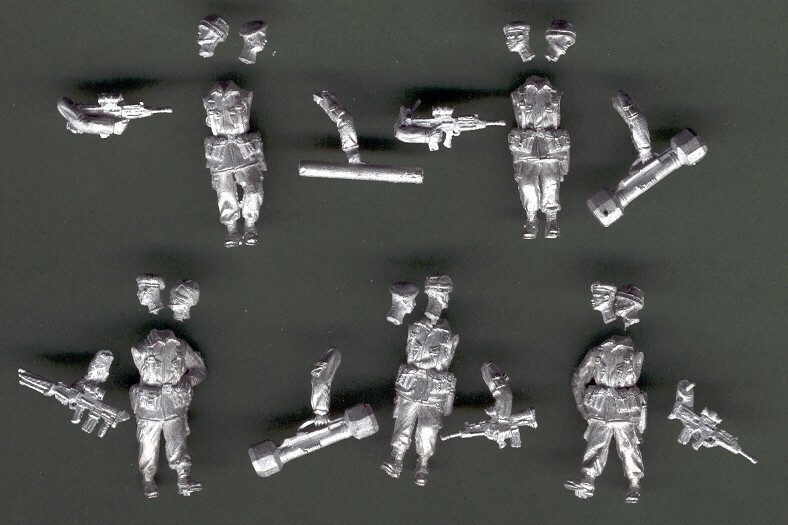 USE 4 60 mm Mortar & Special Forces Crew Closer to 1/87 than to 1/72. 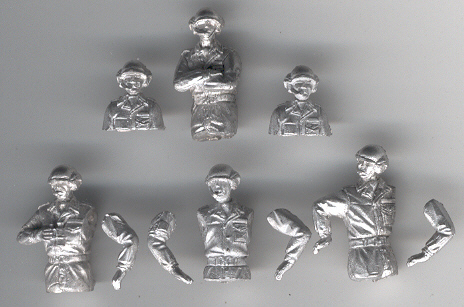 USVC Tank Commanders/Crew 6 full length figures. Closer to 1/87 than to 1/72.